Denise Frazier reviews “R You Afraid of the Dark” at The Front. John Isiah, Boogeyman 2. Oil on canvas. Courtesy the artist. Curated by artist John Isiah, “R You Afraid of the Dark” features his work alongside that of Jaroid Henry and 50IV, ushering in the most surreal season of the year. 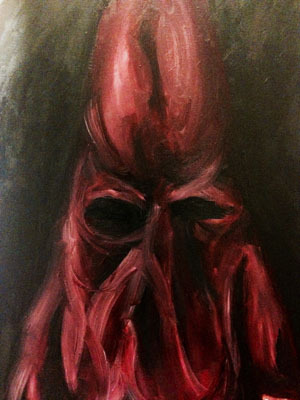 Isiah’s mischievous sense of humor outfits the Ku Klux Klan in saturated hues including “Boogeyman Red” and “Boogeyman Blue.” Dark, almost alien-like hooded heads centered on the canvas maintain a sinister tone. And while Klan robes do range in color, often indicating status or role within the group, Isiah’s renderings simultaneously appeal to our inner rascal that would see their fear mongering—so associated with the white hoods—neutered through a silly pop of color. The aesthetic connection to Carnival’s glittering mounted knights is not lost, adding another disturbing layer. Disturbing seems to be the order of the day as Isiah pits these images against his Four Little Hooded Girls. Both subjects don “hoods” in these portraits—the girls in matching sweatshirts, the Klan in full regalia—and the red and violet of the robes mirror the flat, brushy backgrounds framing the girls’ heads. This interplay of color and content—the sweet faces and the hateful masks—is upsetting, and despite their contemporary dress, it is hard to imagine Isiah isn’t consciously referencing the four African-American girls killed in the 1963 Birmingham Church Bombing, when a local Klan chapter detonated a bomb before Sunday service. 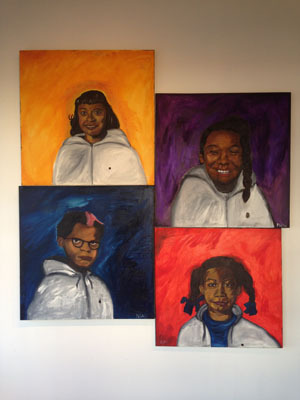 The girls’ sweatshirts also bear a red bullet wound, which the artist has connected to the shooting of Trayvon Martin. The pieces are no doubt raw, but through them Isiah seems to be engaging in a realized dialogue on race and class, and the inextricable link between victim and perpetrator. John Isiah, Four Little Hooded Girls. Oil on canvas. Courtesy the artist.